This rare and elusive oil is only grown on the island of Java, it’s certified organic and has been sustainably produced. This oil should protect you against all insects and it has unique features which are not found in common citronella oil. Java citronella is at least double the strength as common citronella, this may be due to the insects being unable to build up a tolerance to it because of its rarity. Citronella oil is said to have many different qualities. If diluted in a base oil, when it’s put onto skin it can create a mild warming sensation which can be used to help alleviate physical muscle and joint pain. In addition, the smell of this oil can assist with nervous fatigue as it has clarifying properties. Some people even use it to ease pressure from headaches and migraines. Oils which often blend nicely with citronella include orange, lemon, geranium, bergamot and cedarwood. Citronella oil has very low toxic levels and isn’t used in large amounts so it has a minimal or no risk to the environment and wildlife. So it can be used at home without any adverse effects expected. Directions: Dilute at least 1 to 6 before applying to skin. Can be used in any oil diffusers or burners. Add to base oil for massage or bathing. Can be added to any cream, shampoo, etc. Top up incognito or any other natural insect repellent for greater efficacy. Add a few drops to your clothes or luggage to keep them smelling fresh and unwanted small visitors away. Caution: Pure organic essential oil; always carry out a patch test when diluting and dilute further if any irritation occurs. Stop using if irritation continues. The Incognito Java Citronella Oil - 10ml product ethics are indicated below. To learn more about these product ethics and to see related products, follow the links below. Very few flies and insects in my home because this oil deters them. 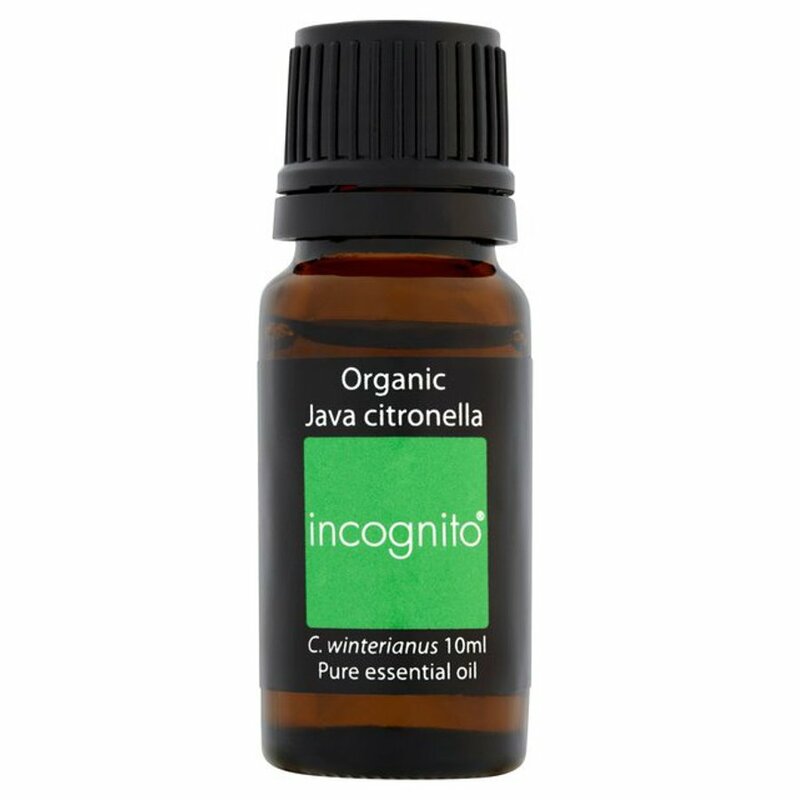 There are currently no questions to display about Incognito Java Citronella Oil - 10ml.